Exciting news that will encourage stem cell research in the USA! Wouldn’t it be GREAT “to spur insulin production and spare a child from a lifetime of needles…” (and to spare adults too!!). I’m realistic and not expecting a sudden cure, but this seems to be a step in the right direction! Thank you Dr. Banting and Best!! For those of us who are dependent on insulin, we can thank our lives to Dr. Frederick Banting and Charles Best who discovered insulin in 1921. Their discovery truly changed the future of many people living with diabetes (more specifically, gave them a future). There is a good summary of the discovery of insulin here. When I was diagnosed with diabetes, I never really thought much about a cure because (thanks to Dr. Banting et al) I had insulin. I even wondered why people were fighting so hard for a cure for type 1 diabetes when we can survive “just fine” on insulin. I have since learned that insulin is not a cure. It is not a cure because (as anyone who depends on injected insulin can tell you) you cannot control your blood sugar at all times. But also, it is not a cure because for people living with type 1 diabetes we are missing more than just insulin. When our bodies stopped producing insulin, they also stopped producing c-peptide and amylin, which have vital roles in protecting our organs and nerves. Check out this post at Allie’s Voice to learn more. Of course, I don’t want to underestimate the importance of the discovery of insulin, but I (now) realize that INSULIN IS NOT A CURE. 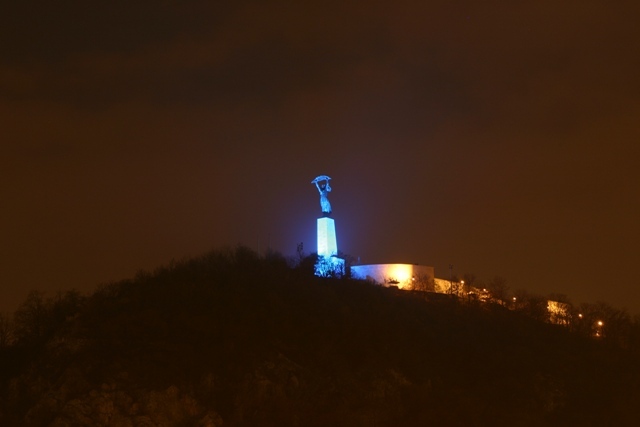 World Diabetes Day: Lighting Budapest up in blue! We were very impressed by all the businesses that decided to honor World Diabetes Day by “lighting up” in blue as well… a used clothes store, good ol’ Samsonite, and a tourist exchange office (check out those exchange rates)! 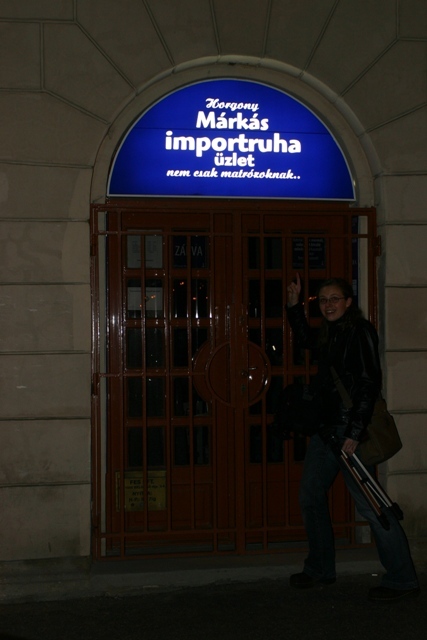 A used clothes store decides to light up in blue on WDD! 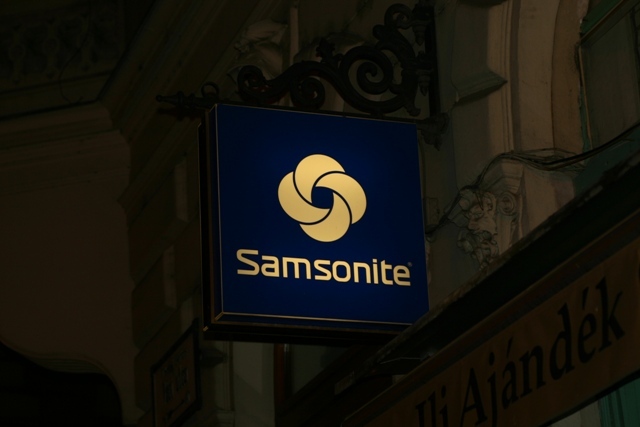 Samsonite decides to light up in blue! 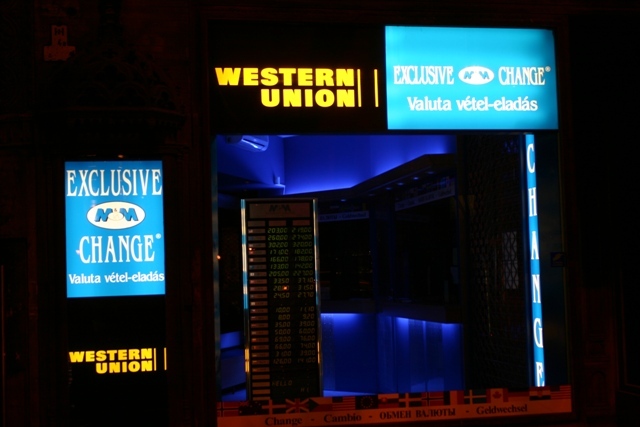 Foreign currency exchange office decides to light up in blue! Can you see the kink at the end of this cannula? Yeah, me neither. It’s hardly detectable, but it is there. The kink in the last millimeter of this infusion set really put a kink in my day. Last week, I started on the Minimed Paradigm 722 after four years on the Cozmo (long story short: I love my Cozmo, but it’s not available where I currently live outside of the USA, so I had to switch pump brands. For a thorough review and ideas on how to Cozmofy a Minimed pump, check back next week!). A new pump gave me an excuse to try out some new infusion sets. I have been faithful to the long Comfort (same as Silhouette), manually inserted. At first, I used it out of ignorance (no one ever told me that there was more than one type of infusion set). Then because I am a creature of habit. As it turns out, I have a pretty significant amount of scar tissue (OK, really how is an insulin pumper to know how much scare tissue is “normal”– yes I’m covered is polka dots, but I thought we all were). My doctor and pump rep told me it was time to try a new infusion set that I would wear on my stomach (I hated wearing Comfort/Silhouettes on my stomach). So I was sent home with a bunch of 9mm Quick Sets. Being a creature of habit, I was skeptical. Rightfully so. Even using that fancy device (Serter), I seem to keep getting bent cannulas. The bend is barely visible to the naked eye, but my blood sugars know when it’s there. Last week’s basal testing revealed that my morning basals are spot on (can’t say the same for the rest of the day) and I meticulously counted my carbs or breakfast and bolused 30 minutes before eating. So I was pretty disappointed by the after breakfast high blood sugar that stubbornly refused to come down. After a couple hours of troubleshooting, I removed the infusion set and can only figure that THAT was the problem. How many people can say that their morning was ruined by a 1mm bend at the end of a 9mm plastic tube? I can. Just a reminder that little things make a BIG difference! Forgetfulness + diabetes = ??? It’s been a busy month. Somehow once I get past a certain point of “overwhelmed”, I become very forgetful. In the last week, I have been SO forgetful: forgetting to do things for work, forgetting where I need to be, forgetting what I was thinking about a minute ago. So I keep lists, set reminders, and try to deal with the forgetfulness. But it doesn’t make for easy blood sugar management. Here’s what happened tonight. I tested in the evening before bed. 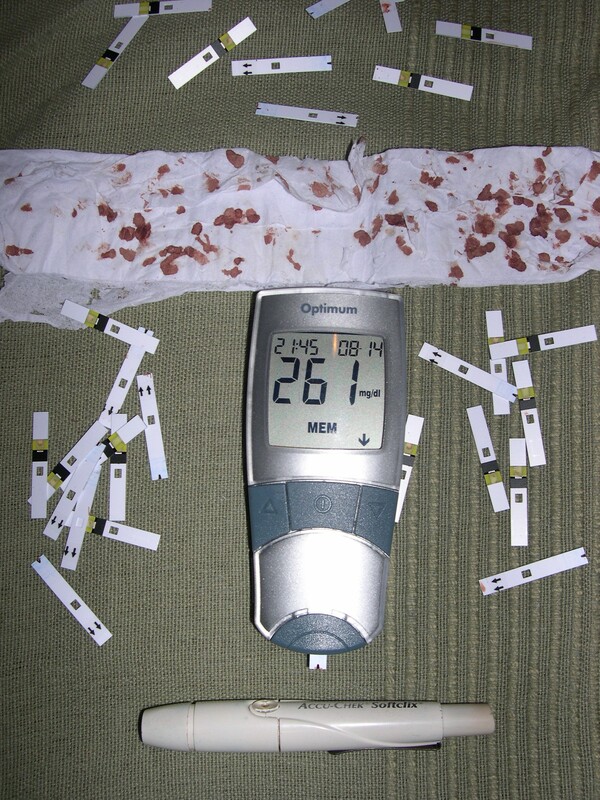 My blood sugar was 55 mg/dl. I decided that the treatment for this low blood sugar should include juice (6g) and a chocolate bar (14g). I drank a shot glass of juice (yes, I treat my lows using a shot glass to measure my juice). About 20 minutes later, I think “did I eat that that chocolate bar”? I have absolutely no idea. Maybe I did. Maybe I didn’t. Sounds like no big deal– unless you realize that this is the difference between good blood sugar through the night or facing a nighttime low. I figure that I am 75% sure that I ate the chocolate bar that will prevent the nighttime low. To be safe, I ate a 6g chocolate bar, figuring that it’s better to risk being a little high in the morning. Two hours after falling asleep, I awake in a cold sweat and the meter confirms the low at 48 mg/dl. So I sit here writing to you to tell you that I solved the mystery, I did NOT eat that chocolate bar before bed and to let you know that forgetfulness and diabetes are not a good combination. 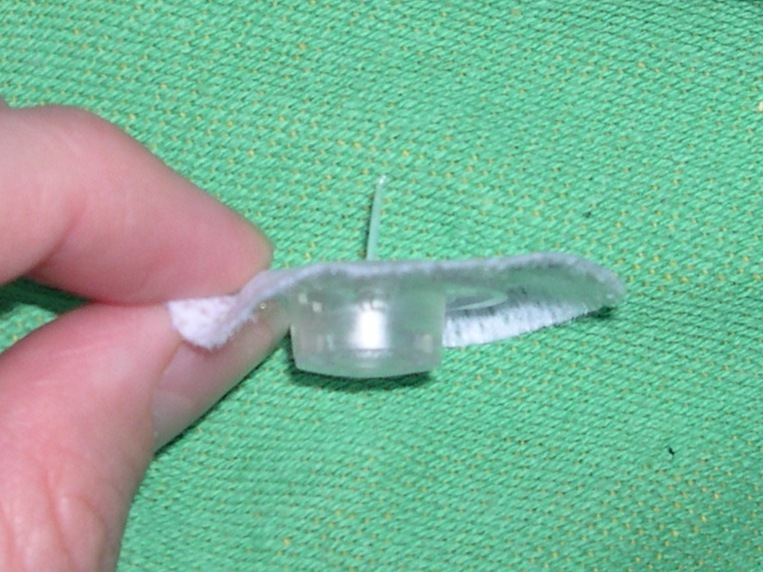 Being on an insulin pump means wearing an infusion set (small plastic catheter that delivers insulin into fat), I wear my infusion set either on the outside of my upper thigh or just below the belt on my rear end. This week, I just observed how aware I am of where my infusion set is, completely on a subconscious level. This week is a “left-sided” week. My infusion set is on my right thigh. This means that I sleep on my left side, carry my bags and purses on my left side, … Next week will be a “right-sided” week. When my infusion set switches side, I pretty much automatically switch everything else. It hit me this week that this is something that I don’t think much about– it’s almost automatic. When I pack up my books for work, I pick up my bag and somehow it’s on the correct side. Now I have another good reason for site rotation. If I don’t I will lead a really lopsided life! Nobody likes having a cold. But diabetes makes dealing with colds even less fun. When I get a bad cold, it seems that there is nothing that I can do to control my blood sugar. My body is resistant to insulin and I am less likely to feel the lows. So I can never seem to find the right amount of insulin for my virus-filled body. So I coast in the 200’s, which makes it hard for my body to fight the infection, which gives me blood sugars in the 200’s, which makes it hard for my body to fight the infection, which gives me blood sugars in the 200’s, which makes it hard for my body to fight the infection, which gives me blood sugars in the 200’s, which makes it hard for my body to fight the infection, which gives me blood sugars in the 200’s, … (you get the idea). The current plan: TEST OFTEN and try to find a way out the the vicious cycle.